An antique Persian carpet made in Tabriz, Iran. Hand woven of silk pile and silk foundation. Cream colored fringe at each end of the 8’7″ width. 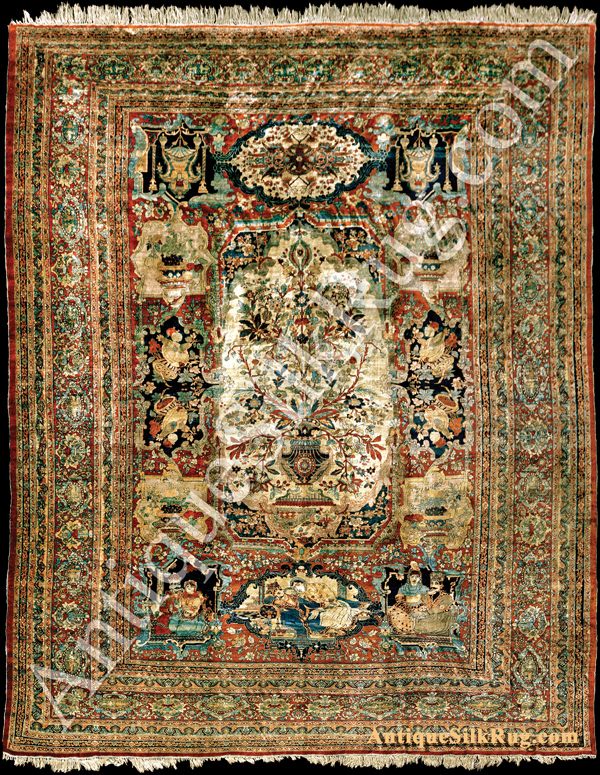 In the center of the carpet appears a large tree of life design stemming from an ornate base. The tree of life is portrayed against a cream colored background. Under the center tree of life, three panels illustrate reclining male and female figures. The basic color of the carpet is an orange-red or rust, although the carpet is replete with multi colors, especially dark and light blues. Reward for information leading to recovery. Even if you do not have information, see how you can raise awareness.